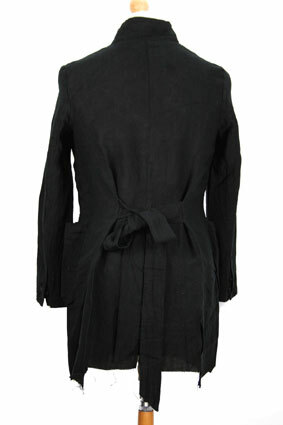 Alexsandr Manamis soft, washed, unstructured linen coat with built-in waistcoat in black. Notched collar. 4 button fastening. 2 loose patch pockets. 2 button working cuffs. Triple overlapping vents at rear. Attached fabric belt at rear. Raw edges throughout. Single button waistcoat inside, with patch pocket on the left. Stunning coat, stylish and, well it is just right! Matches the trousers in the same fabric.